I like playing with makeup and changing my look. In the past, I’ve written about vegan makeup, but I happened to list brands that are pricy. For most of my life (and still today), I’ve been more of a bargain hunter. That’s why I’m happy to share with you some inexpensive brands that don’t test on animals! Eyes, Lips, Face, or e.l.f, is a brand of cosmetics with a great price point. They sell loads of fun makeup and synthetic brushes too! 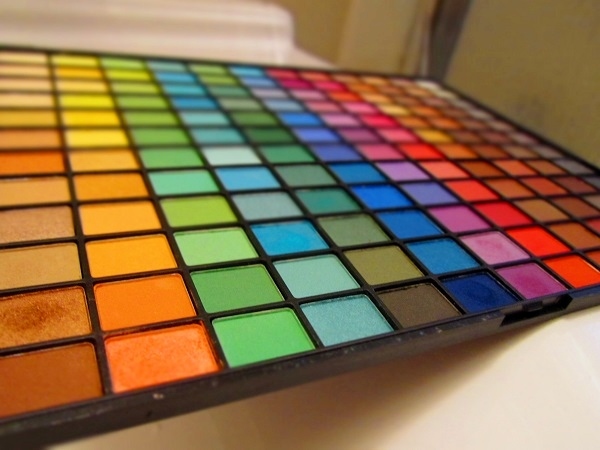 Last holiday season, I treated myself to a 100-color eyeshadow palette. It’s a lot of fun. The pigment isn’t super intense so even the bold colors are wearable. 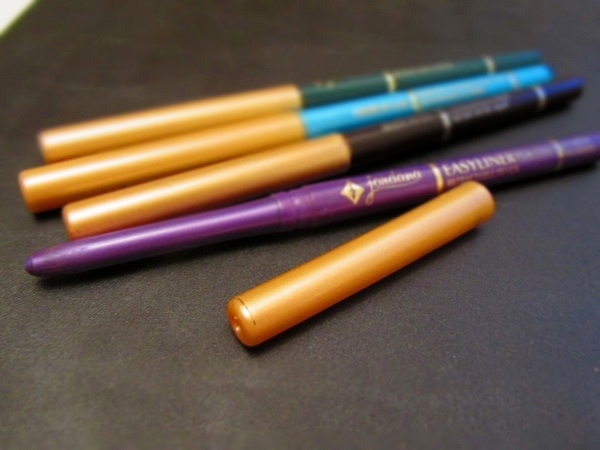 Jordana makes my favorite eyeliner in any price range. There’s a range of colors (the dark brown is my go-to, but I’ll branch out with brights sometimes). Their liners are self sharpening too, so you’ll always have a nice tip (without slivers–ouch!). I think these are less than $5 each. They sell lip liners too, as well as nail polish and other cosmetics, such as shadows. They’re made in the USA and available at your local drug store. Jordana’s website states that they do not test on animals or buy ingredients that were tested on animals. Some of their products contain animal ingredients, so read the labels! Wet n Wild is another drug store brand that doesn’t test on animals. Thanks to Luminous Vegans for that tip! 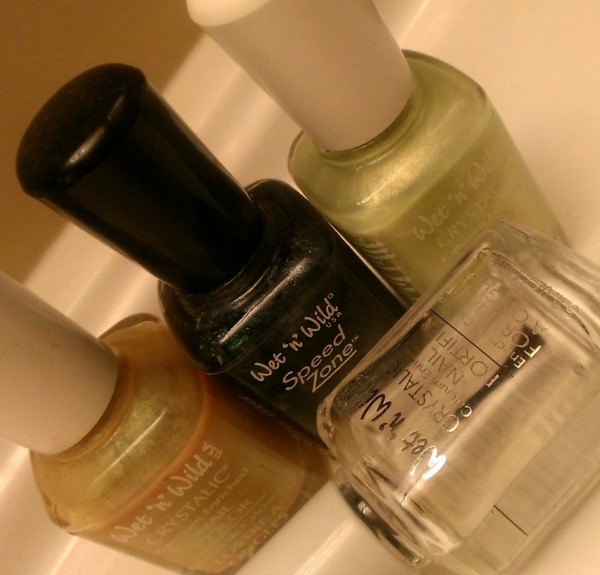 Wet n Wild sells formaldehyde-free nail polish, which is great news for a lot of us! The Wet n Wild website states, “As a Peta-certified, cruelty-free brand, we’re proud to say we have never and will never test on animals. We also make it a point to work with cruelty-free, third-party vendors. Wet n Wild loves our furry, scaly, and feathery friends!” Some of their makeup does contain carmine (a dye derived from insects). You can see which items are vegan and which aren’t on their FAQ. It’s true that these aren’t vegan-owned companies, but for those of us on a budget, or who want to try out a makeup trend without spending a fortune, we have options. You can see PETA’s complete list for the latest info. 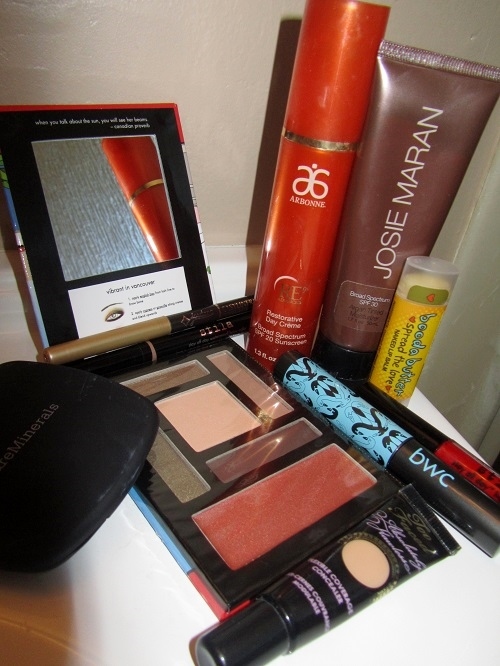 Do you know of other cruelty-free makeup for people on a budget? I’m getting ready for a trip and, as a light packer, I’m already planning what to bring. I only use products that are vegan and haven’t been tested on animals. Here’s a look at what’s coming with me. I light dusting of powder foundation is optional, but I like to be prepared. The Bare Minerals foundation also has SPF and is a nice way to mattify is sunscreen gets me shiny. This Stila kit has five shadows that I can mix and match for day or night and a convertible lip and cheek cream. It includes a mirror and folds flat. Update: Stila is not longer a cruelty-free company. I can’t live without my Stila liquid brow liner. Since Stila stopped being cruelty-free, I’ve discovered Milani. Not all of their products are vegan, but their site has an entire vegan section. I love Milani’s mechanical brow pencil. The secret to a natural look is the right shade. I use taupe, and I make tiny brush strokes in the direction of my brows. It’s great to fill in and define. Well-defined brows really frame the face and are youthful looking. A few weeks ago, while poking around the shelves at Sephora, I discovered Josie Maran Argan Oil. I’ve been on a quest to find vegan beauty products. I thought I was shopping cruelty-free but I was horrified to discover a few items in my stash are by companies that still test on animals. Shameful! Hundreds of thousands of animals are poisoned, blinded and killed every year for cruel and unnecessary tests. It’s not required by law and there are better alternatives. Check for the cruelty-free bunny logo, a vegan logo, or look at PETA’s database to make sure the companies you support don’t make animals suffer in the name of beauty. The woman at Sephora (edit: was wrong when she) explained that the entire Josie Maran line is vegan and cruelty-free, meaning no animal ingredients and no animal testing. (Update 4/7/15: I found out from a reader that the line isn’t all-vegan. When I checked on the JM site–which I should always do instead of trusting sales people–I found out that not all of the products are vegan. They use beeswax, lanolin, and carmine in some of their products. Check the label for the V to be sure). Josie Maran sources argan oil from co-ops that help women in rural Morocco earn a decent living in good labor conditions, while working toward improved literacy. I love that and I’m willing to pay more for a product with those values. Besides, the oil is great! It’s not greasy and it absorbs quickly. 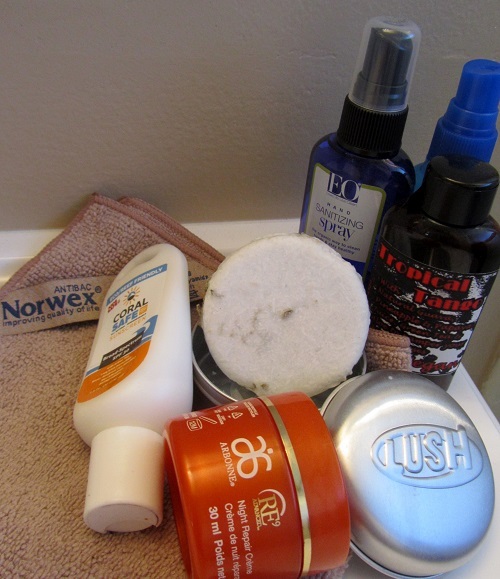 I use it on my face, the dry ends of my hair, my cuticles, and my elbows. I told my friend Karthik about it and she said she uses Josie Maran products too–specifically their tinted moisturizer. So we planned to stop by Sephora and see if I could get some too. Karthik’s issue with sunscreens is that most leave a whitish residue on her face. The Josie Maran moisturizer doesn’t. My issue is that even the lightest tinted moisturizer looks orange on my skin and you can see where the product stops and my natural color begins. This moisturizer is tinted just right. It blends in, it’s lightweight, and left us glowing, not greasy. I’ve even stopped wearing pressed powder. I really only ever used it to hide the shine of sunscreen. I can’t wait to try their cosmetics too. Argan oil mascara? Sign me up! We also tried products by other cruelty-free companies (Tarte and Stila) and popped into Lush, so come on back for more of our reviews! Note: This isn’t a sponsored post. I wasn’t compensated to review these products. I just really like them. Also, the content of this post was originally published on my other blog, Jean of all Trades.